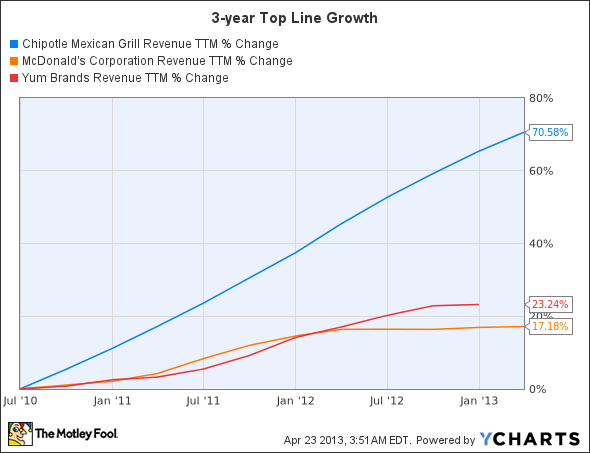 Can Chipotle Mexican Grill, Inc. (CMG) Keep Climbing This Year? 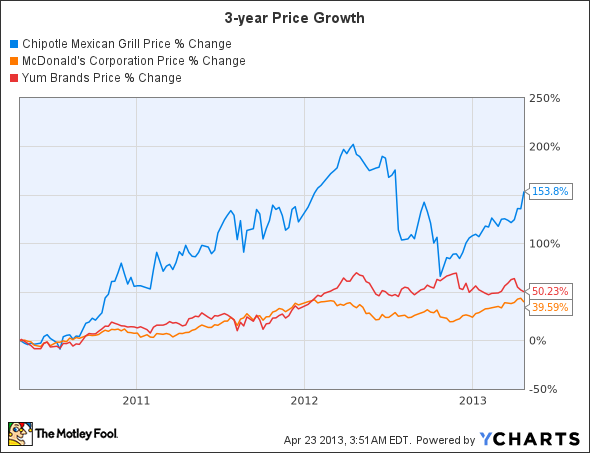 Chipotle Mexican Grill, Inc. (NYSE:CMG) has been one of the fastest rising restaurant stocks in the past decade. Since its public debut in 2006, the stock has risen 760%, easily outperforming both McDonald’s Corporation (NYSE:MCD) and Yum! Brands, Inc. (NYSE:YUM). Although Chipotle only started with 16 locations when it was founded in 1993, a major investment from McDonald’s helped the company expand to 500 locations by the end of 2005. Despite its growth, Chipotle is a very divisive stock with value and growth investors, due to its consistently high P/E ratio. Let’s look back at Chipotle’s first quarter earnings to see if it can continue to outperform its industry peers. For its first quarter, Chipotle Mexican Grill, Inc. (NYSE:CMG)’s earnings per share rose 24.4% to $2.45, which soundly beat the consensus estimate of $2.14 per share. Revenue rose 13.4% to $726.8 million, also topping the expected $725 million. By comparison, McDonald’s Corporation (NYSE:MCD)’s first quarter earnings grew by an anemic 0.8%, while revenue rose 1%. However, Chipotle’s main competitor, Yum! Brands, Inc. (NYSE:YUM)’s Taco Bell, which is mainly located in North America, reported 8% same-store sales growth in 2012. Most of Chipotle’s surge in revenue was attributed to its 48 new restaurant openings during the quarter, which brought its total store count to 1,458 at the end of March. But same-store sales only rose 1%, a disappointing decline from the 12.7% growth it reported in the prior year quarter. Excluding the impact of Easter and the lack of a leap day, same-store sales actually rose 3%. Chipotle’s same-stores sales growth actually outpaced McDonald’s, which reported a 1% decline in global same-store sales. McDonald’s U.S. same-store sales notably dropped 1.2%, as the company attempted to boost sales by emphasizing its value menu. Chipotle Mexican Grill, Inc. (NYSE:CMG), on the other hand, doesn’t offer a value menu. Both companies, along with the rest of the quick serve restaurant industry, have struggled with rising food costs, adverse weather conditions and a slowdown in consumer spending. Much of Chipotle’s success has been attributed to the rising popularity of ‘bistro quick serve restaurants’, such as Chipotle and Panera Bread Co (NASDAQ:PNRA). Both Chipotle and Panera are increasingly regarded as healthier alternatives to traditional fast food chains McDonald’s and Yum! Brands. Chipotle Mexican Grill, Inc. (NYSE:CMG) has carved out a niche for itself with health-conscious consumers by using locally grown, organic ingredients. Panera has also adopted the same approach, and claims to use mostly organic ingredients in its sandwiches, salads and soups. This movement started by Chipotle and Panera Bread Co (NASDAQ:PNRA) has caused ripples throughout the North American restaurant industry, with many customers now favoring restaurants that use locally grown ingredients over those that rely on international food service companies such as SYSCO Corporation (NYSE:SYY). This backlash has hit both lower-end fast food restaurants, such as McDonald’s and Yum!, as well as more expensive full-service diners, such as Darden Restaurants, Inc. (NYSE:DRI), the parent company of Olive Garden and Red Lobster. Chipotle’s 1,458 locations are concentrated mostly in the United States and Canada, which has insulated it from the Chinese troubles that have sunk Yum! Brands, and the European woes that continue to weigh on McDonald’s. Chipotle has relatively minor exposure to Europe with stores in England and France. Rising food costs, exacerbated by high fuel costs and adverse weather conditions, remain a huge burden for the restaurant industry. Chipotle Mexican Grill, Inc. (NYSE:CMG)’s food costs increased 80 basis points to 33.0% of total revenue during the quarter, which forced the company to slightly raise its menu prices. Prices for chicken, cheese and salsa ingredients were hit the hardest.